Houben, Jan. 2018. Linguistic paradox and diglossia: The emergence of Sanskrit and Sanskritic language in ancient India. Open Linguistics 4(1). 1–18. “We know that Middle Indian (Middle Indo-Aryan) makes its appearance in epigraphy prior to Sanskrit: this is the great linguistic paradox of India.” In these words Louis Renou (1956: 84) referred to a problem in Sanskrit studies for which so far no satisfactory solution had been found. I will here propose that the perceived “paradox” derives from the lack of acknowledgement of certain parameters in the linguistic situation of Ancient India which were insufficiently appreciated in Renou’s time, but which are at present open to systematic exploration with the help of by now well established sociolinguistic concepts, notably the concept of “diglossia”. Three issues will here be addressed in the light of references to ancient and classical Indian texts, Sanskrit and Sanskritic. A simple genetic model is indadequate, especially when the ‘linguistic area’ applies also to what can be reconstructed for earlier periods. The so-called Sanskrit “Hybrids” in the first millennium CE, including the Prakrits and Epics, are rather to be regarded as emerging “Ausbau” languages of Indo-Aryan with hardly any significant mutual “Abstand” before they will be succesfully “roofed,” in the second half of the first millennium CE, by “classical” Sanskrit. The history of (classical) Sanskrit, of Prakrit, of the so-called “hybrid” Sanskrits, of Vedic poetry and prose, and of the related Avestan and old Persian languages is of central importance for the cultural history of ancient India, ancient Iran and Asia. Sanskrit and Persian—both as languages and cultural systems—overlapped in time and space for several centuries on the precolonial subcontinent. But only more recently have scholars investigated points of intersection and exchange between these two linguistic and intellectual traditions. Scholars of Indo-Persian have recently devoted substantial attention to various sorts of Sanskrit-Persian encounters, such as the translation of Sanskrit works into Persian and multilingual patronage ties. In this conference, we aim to highlight and spur thinking about similar cross-cultural interactions between members of the Sanskrit and Persian traditions from the vantage point of Sanskrit literary culture. The last few decades have witnessed a surge in scholarly attention to Sanskrit during the medieval and early modern periods. Within this wider area of interest, many scholars have begun to ask questions about how Sanskrit thinkers conceptualized Persian, the only viable rival to Sanskrit as a transregional idiom, and exchanges between the two traditions. Sanskrit-focused scholarship sheds light on intellectual, social and literary aspects of medieval and early modern India and is thus crucial for understanding these complex periods. Sanskrit texts also provide tools for analyzing the larger categories that we use for precolonial Indian literature, including the popular but problematic idea of “Indo-Persian” as a distinct literary and cultural realm. Yet such scholarship is still in its infancy and struggles for attention among a wider audience. This conference will highlight fresh, dynamic research and consider future avenues, both individually and collectively, for emphasizing Sanskrit materials in the exciting, but currently Persian-dominated, study of medieval and early modern India. We aim to give coherence and visibility to an emerging, vibrant subfield of South Asian studies, especially the crucial place of Sanskrit materials and Sanskritists within that subfield. Kahl, Oliver. 2015. 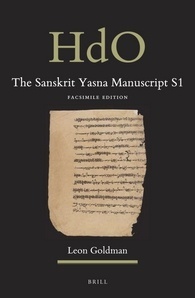 The Sanskrit, Syriac and Persian sources in the comprehensive book of Rhazes. Brill. This work offers a critical analysis of the Sanskrit, Syriac and Persian sources in Rhazes’ (d. 925 CE) Comprehensive Book (or al-Kitāb al-Ḥāwī), a hugely famous and highly unusual medico-pharmaceutical encyclopedia originally written in Arabic. All text material appears in full Arabic with English translations throughout, whilst the traceable Indian fragments are represented here, for the first time, in both the original Sanskrit and corresponding English translations. The philological core of the book is framed by a detailed introductory study on the transmission of Indian, Syrian and Iranian medicine and pharmacy to the Arabs, and by extensive bilingual glossaries of relevant Arabic and Sanskrit terms as well as Latin botanical identifications.